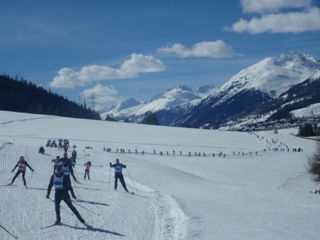 This year’s Engadin Skimarathon was the first ski race for me with perfect condition, not so cold temperature, no wind, snow is excellent and blue sky! Most of the skiers enjoyed first ski race, one of the marvelous result is winner’s time of women who was a finnish lady, her time is 1:29:52, it is only 1min 33sec later than the men’s winner time 1:28:19. Each food station and finish line, there were so many boys and girls volunteers, we got much more power from them, thanks a lot for them. 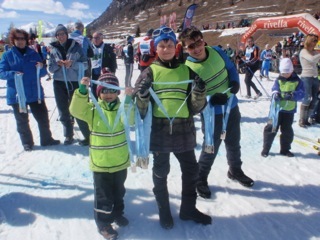 I guess they enjoyed their work and watching many skiers, but why are there no children’s ski race of Engadin Skimarathon this weekend? You have enough room for kids and junior small race, if you start children’s ski race on Saturday, it will be a big motivation for their future skiing life. 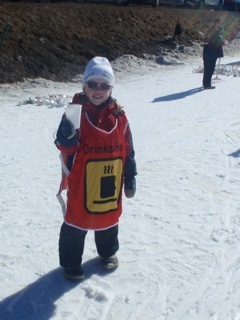 I was very happy to get a new finisher’s medal from a young boy at the finish line. 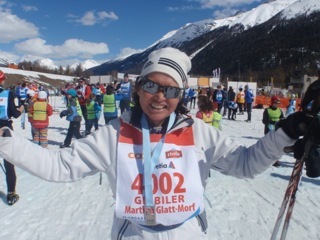 My private experience of Engadin Skimarathon in 2013, my race was Engadin Toi Toi Skimarathon. Under such a wonderful condition, I started with no problems, but I felt abdominal pain before St. Moritz, I need to visit the toilet soon, my condition were rapidly changing, water like diarrhea. I stayed long time in the toilet, each food station after I took drink and foods I need to go the toilet. Between toilet and toilet my skiig was sprint. At last I was very lucky to arrived finish line and get a new finisher’s medal from a young boy.